How we grip the gun will determine a lot about how well we are able to shoot the gun. The better and more sound our gripping technique, the faster we can run the gun while maintaining the level of accuracy the target demands. Below, we'll explore one take on that technique, and how one person gets it done. The primary performance goals associated with gripping a handgun are mitigating any deficiencies in trigger control skill and managing recoil as best as possible without compromising other performance areas, or impeding the function of the gun. Different people being different (Ha! Surprise!! ), there will always be some minor variation on technique to best accomplish the mission. This is a breakdown of what I have found to work well for me. Take it, use what works for you, and ditch the rest if it doesn’t work. We want to grip the gun high, the higher the better, generally speaking. The only caveat here is that I do not want to compromise the function of the firearm. The web of the hand between the thumb and index finger should be pressed into the rear tang/beaver tail of the handgun. The goal here is to get the hand has high as possible to limit the leverage the reciprocating slide has over our grip, and also to use the beavertail to leverage against the gun. For handguns with safeties setup like a 1911, the shooting hand thumb should rest on top of the safety. This helps to properly position the hand, and has the added value of ensuring the safety is disengaged when it needs to be, and stays that way. 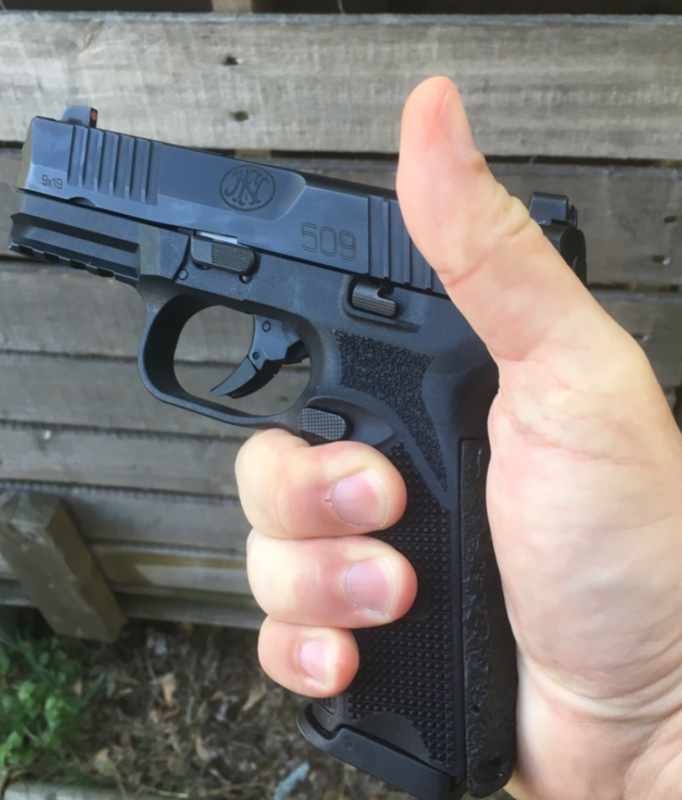 If the thumb is placed below the thumb safety, it can be inadvertently re-engaged as the gun is fired and recoils. 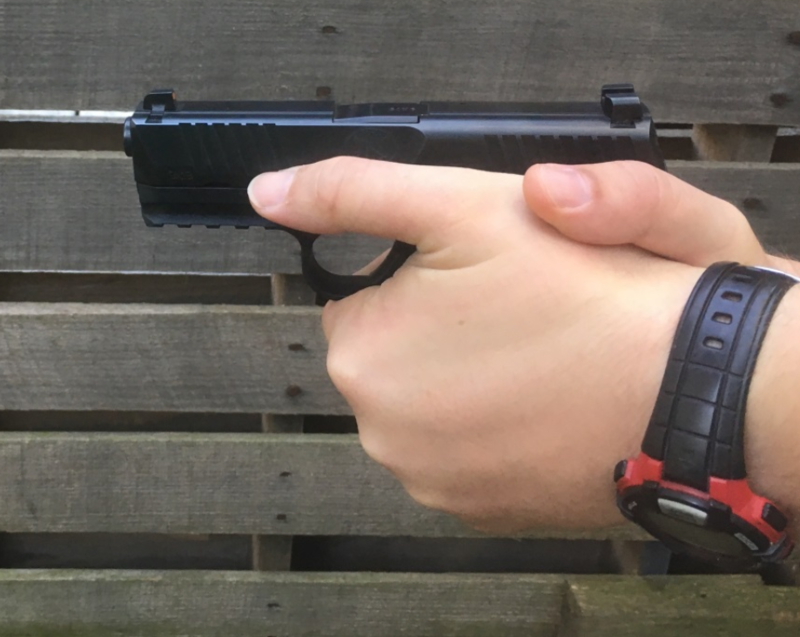 When initially establishing the grip, before the support hand has come to meet the gun, the shooting hand thumb should remain flagged in an up position. This allows access to where the support hand needs to go in order to maximize contact with the firearm as high on the grip as possible. If the thumb is folded down, or not raised high enough, it will block access to this area, or end up under the support hand. For the purposes of recoil management and trigger control, it is necessary to maximize the support hand contact with the firearm. When bringing the support hand to the gun, use the top of the index finger as a physical indexing point on the bottom of the trigger guard to make sure the hand is properly placed. By using a physical, repeatable index it allows us to have consistency in establishing our grip and make any necessary adjustments early in the gripping process. This index point will vary slightly from shooter to shooter, but generally speaking it will be somewhere around the 2nd knuckle on the finger. Over time, with consistent practice, it will become second nature to establish the support hand grip using this method. Once the index is acquired and confirmed, the support hand is folded into the grip. The support hand thumb points forward, along the side of the slide, and the “meat” of the support hand at the base of the thumb is pressed into the side of the grip by the clamping force of the fingers. You can also “lock” the wrist and rotate the elbows up or down depending on your desired flavor and increase the pressure on the gun. Personally, I rotate my elbows up, very slightly. It is so slight that it is hardly perceptible from the outside looking in. Other shooters I know rotate their elbows down and do well with that. I think the key here is using more than just the hands to get pressure on the gun; however you want to do that. Putting the two hands together, gun in the middle, we now have a couple things to figure out. What do we do with our shooting hand thumb, and what do we do with our support hand thumb that is out along the frame of the gun? I know some people teach to use both of those to apply downward pressure either on the grip, or the gun itself, especially with the support hand thumb against the frame. I have found those to actually be a bit counterproductive in terms of maintaining accuracy at speed. I actually just lay my shooting hand thumb on top of my support hand with no pressure applied. This increases dexterity in my trigger finger. My support hand thumb actually floats away from the frame when shooting, and the focus of my grip strength is further back on the gun near the rear of the grip. Once it is all put together, the shooting hand is mostly applying force on the grip front and back, and I really try to emphasize engaging the whole hand. I think a lot of times we forget about that pinky down at the bottom of the grip, but if I really make a point of fully utilizing the last two fingers on the shooting hand, it can help to counteract any upward rotation of the gun under recoil. My support hand is putting pressure on the gun from the sides, with a focus on really trying to keep that pressure behind the gun as well by getting it as far back on the grip as my hand size will allow. If I do it all right, the gun stays pretty flat through the firing cycle and that allows for a quicker recovery, and faster second, third, or fourth shots. Like I said at the beginning, different people will require tweaks here and there to find what works best for them. Play around with it, and use objective standards, like a shot timer and reasonably sized target to figure out what lets you run the gun the best. Editor's Note: Did you know we teach a lot of basic and advanced shooting skills in our Guardian Nation Skills videos that are made available to our many Guardian members? Check it out. The last two fingers (including pinky) are where most of your grip strength comes from. It is not an afterthought that it is mentioned in the article. Make good use of all steady hold factors. As an instructor and scientist, I must strongly disagree with your information about trigger finger placement. You assert that all people must use the middle one third of the distal second phalange to press the trigger. Physics and common sense dictate that this is incorrect and often almost impossible. A 6’8″ tall person holding a micro .380 can find it virtually impossible to position the middle one third of the distal phalange in such a position. Likewise, a 5 foot tall shooter holding a full-sized pistol can hardly reach the trigger with the middle one third of the distal phalange. The proper location of the distal phalange on the trigger should be, simply, the position at which the pistol will not be pushed or pulled left or right when the trigger is brought straight back. The proper position is the one in which the finger and trigger pull will “finish flat”. Stephen, I think there might be a bit of a misunderstanding because I don’t mention the trigger finger in the article. I only mention the index finger on the support hand, the thumbs on both hands, and the ring and pinky finger on the strong hand. Nate, if you look at the article, there is an embedded Facebook post about the trigger finger placement that does, indeed, show index finger placement on the trigger. That is what Dr. Graham is referring to. Tracking. I guess I hadn’t paid much attention to it. That is a link to another article by a different author that is related content in that it addresses another fundamental aspect of shooting a handgun. Thanks for pointing that out though, because I wasn’t getting it ? I guess that’s one good thing about using an ad blocker. I don’t see those stupid confusing ads on my display. Thank you so much it makes perfect sense. More pictures showing the detail of your explanations would be beneficial.